​High-tech common rail diesel engines that grace the latest crop of 4x4’s are brilliant, powerful and economical machines, but they do need particular care with regards cleanliness in a few key areas – one of which is the fuel filter. Slurping a gutful of dirty diesel into your diesel engine will see you up for up for a hefty repair bill of up to… don’t faint… 10 to 20 grand. Sure you can pretend you’re only going to fill up from reputable stations; but, unfortunately that’s simply not a realistic or failsafe plan. The better option is to ensure only clean fuel finds its way into your high pressure fuel pump by filtering everything – the clean and the not-so-clean. 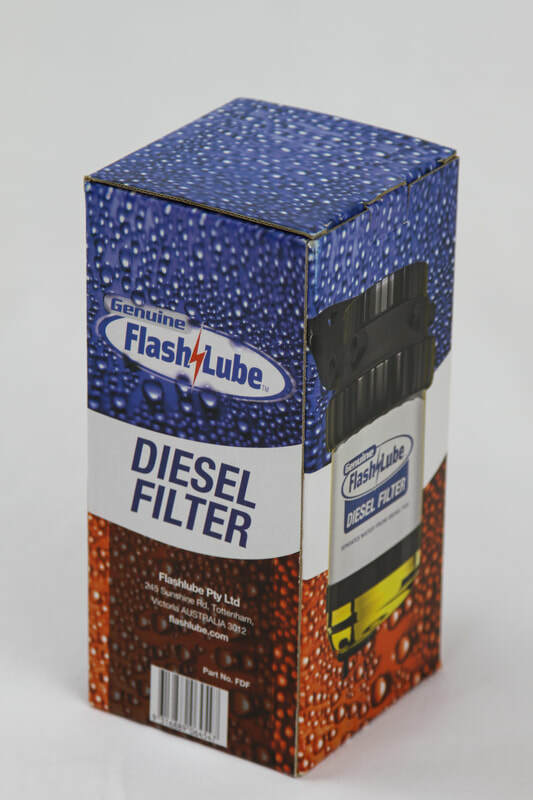 Enter the Flash Lube diesel pre filter; for a small outlay (compared to that huge repair bill) most home mechanics could have one of these kits fitted in an hour or two and never have to worry where you fill up from again. The pre filter kit is exactly that, a filter that is placed before the original equipment filter, not after it and not in place of the standard unit. It’s courser at 30 micron (filters out the big bits) compared to most standard filters at 5 micron and incorporates a water separator to prevent water traveling into injectors and lines. The tap at the bottom of the glass viewing bowl allows easy draining of that water and the replaceable cartridges simply push on and off for fast replacement. The idea of pre-filtering is that all fuel is pre-cleaned (filtered) to rid larger diameter foreign particles (fungus, rust, scale, dirt and water) that would quickly clog the OE filter, rendering it useless and potentially save dirty fuel from flowing into the injector lines and ultimately blocking or fowling the injectors. The pre-filtering kit does not impede the job of the OE filter nor does it negatively affect OE sensors and OE dash-mounted warning lights. Should the pre filter become blocked with contaminates, it’s simply replaced – a much cheaper option than replacing the more expensive OE unit. Ultimately, the OE filter will stay cleaner for longer; however, I’d be sticking with the manufacturers change intervals just to be sure. The kit we fitted to the Troopy also came with a 12 volt water warning kit that features an LED warning light to immediately alert the driver should water be captured in the bowl, plus a vehicle specific bracket and hose kit (along with all necessary nuts, bolts and mounting hardware) to make our job simple. All up, this kit is so damn simple to fit, can potentially save you a fortune in repair bills and I reckon it should be one of the first accessories fitted to all 4x4’s if, for nothing else piece of mind that you’ll only be feeding your engine clean fuel.